Storm surges can occur along coastlines of seas and large lakes. They are one of the types of flooding incidents with the highest damage potential, and led to the most victims until the 2004 tsunami occurred in the Indian Ocean. 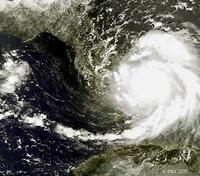 Storm surges in Bangladesh in 1970 and 1991 caused the death of 300 000 and 139 000 people respectively. Storm surge incidents have taken thousands of lives in Europe in the second half of the last century. There were, for example, 2150 victims in the North Sea in 1953. However, highly improved coastal safeguards and the implementation of prediction and warning systems have ensured that major flood disasters - at least in developed countries - occur less often. Nevertheless, storm surges still represent an immense hazard potential on quite narrowly bounded coasts. 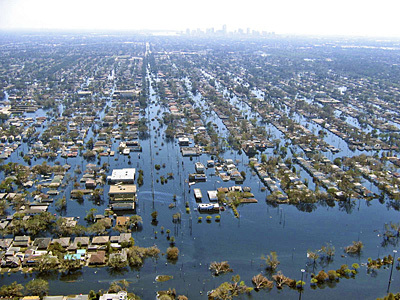 This is what Hurricane Katrina clearly revealed at the end of August 2005. The storm, which was assigned the highest hurricane category (SS5) shortly before it made landfall, ran up an economic bill of 125 billion US$ of which only 60 billion US$ were insured. It became the biggest damage caused by a single incident ever. Because of the storm surge which was caused by the hurricane, a coastline of more than 200 kilometres in length, from Louisiana to Mississippi to Alabama, was devastated, and New Orleans was flooded. In the future, the probable rise in sea level will increase the risk of storm surges and coastal erosions. This is one of the dramatic consequences of global warming.